Line jelly roll pan with parchment paper or silicone baking mat and set aside. Make white cake mix according to package directions. Bake 12-15 minutes or until cake is completely cooked and lightly golden. For the topping: mix cream cheese with hand mixer to loosen. Pour in sweetened condensed milk and stir until smooth. Add in lime zest, lime juice and vanilla until smooth and filling has thickened. Pour over cooled cake and spread evenly. Refrigerate 1-2 hours covered in plastic wrap to set. For the whipped cream: stir cream, powdered sugar and vanilla all together in a bowl until whipped into peaks. 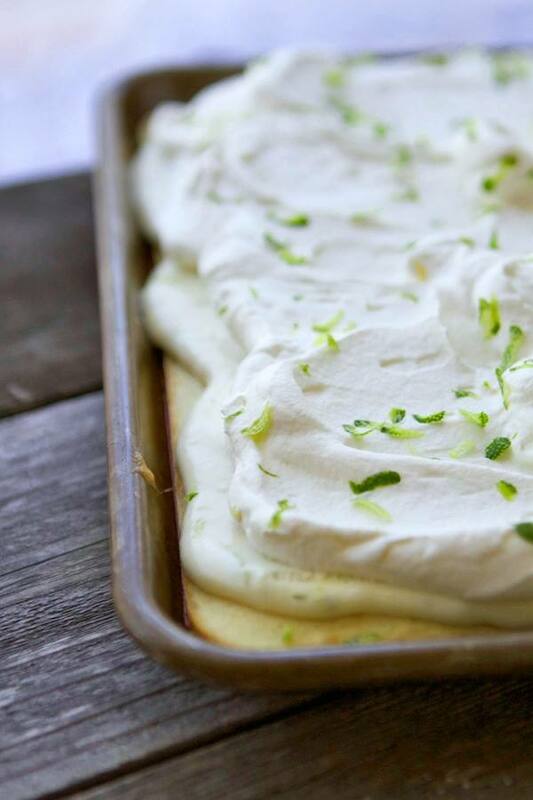 Spread whipped cream over lime filling.